TORONTO (AP) — Max Scherzer lost his second straight start for the first time since 2015 when Marco Estrada pitched 6 2-3 shutout innings and Devon Travis homered Saturday for the Toronto Blue Jays in a 2-0 win over the Washington Nationals. The right-hander, who lost to San Francisco in his previous outing, last lost two straight starts in a three-game skid in August 2015. Travis homered for the second game in a row when he connected in the fifth, right after Scherzer hit Luke Maile with a pitch. Estrada (4-6) allowed three hits, one a bunt single, to win back-to-back starts for the first time this season. Toronto has won six straight at home after losing 10 of its previous 11 at Rogers Centre. 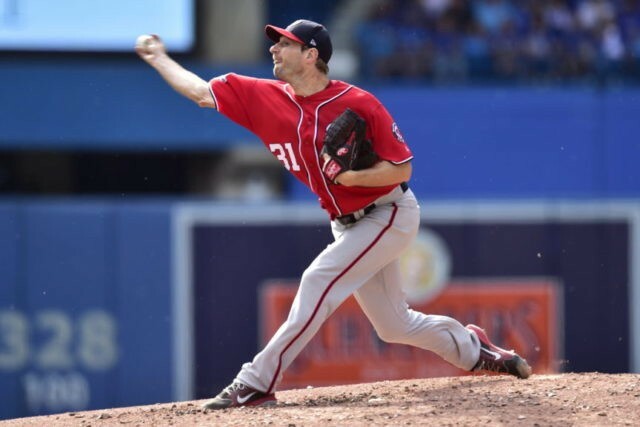 Nationals RHP Tanner Roark (3-7, 3.63) faces Blue Jays RHP Sam Gaviglio (2-2, 3.66) in Sunday’s series finale. Roark has won just once in his past seven starts. Gavoglio allowed a season-worst five earned runs in Monday’s loss at Tampa Bay, his second straight losing decision.